Grocery Coupon Cart has become one of the most popular sources for printable free grocery coupons. You can conveniently browse, select, and print from our latest coupons below. Check back often because we add new coupons to print each week, sometimes even daily. Using coupons to save money has never been this easy! Being a successful grocery couponer takes a little practice. One of the most important things to remember is that coupon research is important. Read our latest coupon news, email newsletter, and check back frequently for new coupons. Visiting grocery store websites for their circulars can also be a huge help. Finding the best match-ups is an easy way to save big. Coupon match-up’s are basically when you pair a coupon with an in store special. Another technique is coupon stacking; when you stack multiple coupons for the same product. This can sometimes be done by using one of our printable coupons with a store coupon (out of the newspaper for example.) This should get you started in the right direction. 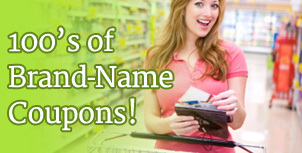 Now grab some grocery coupons and save some money! 20662088 on any ONE (1) Marzetti® Refrigerated Produce Dressing See more!